The driving side of a road is the side on which traffic flows. 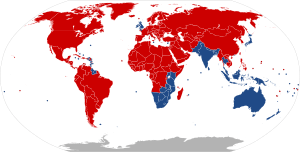 Each country says whether traffic will keep on the right-hand or left-hand side of the road. This is sometimes called the rule of the road. This basic rule makes traffic move easier. It also reduces the risk of head-on collisions. Today about 66.1% of the world's people live in countries who drive on the right-hand. 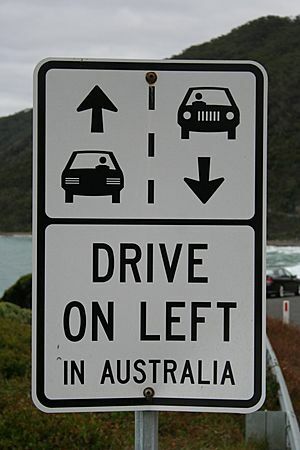 33.9% live in countries that drive on the left-hand. Bolivia is RHT, with the exception of Yungas Road which is LHT to help drivers see their outer wheel. A road in downtown Charlotte Amalie, U.S. Virgin Islands. The entrance to the Channel Tunnel in France. Right- and left-hand traffic Facts for Kids. Kiddle Encyclopedia.